About two months ago we had a broody hen who wouldn’t leave her nest. 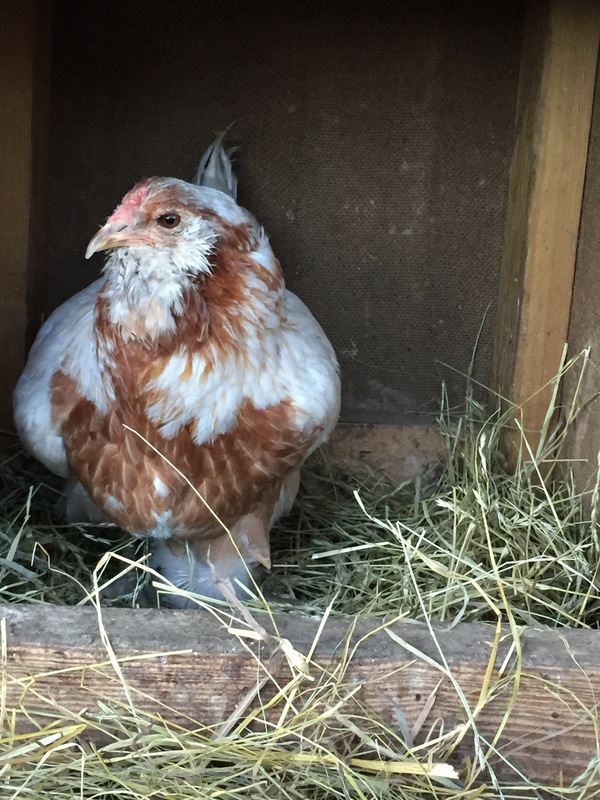 When I opened the nest box to check for eggs she wouldn’t squawk or peck at me but she did hunker down, spread out and cover all her eggs with surprising skill. She looked like she might be the broody who hatched our little duckling Cupcake so I thought I’d give her another chance. I picked out 7 or 8 big clean eggs and slid them under her. 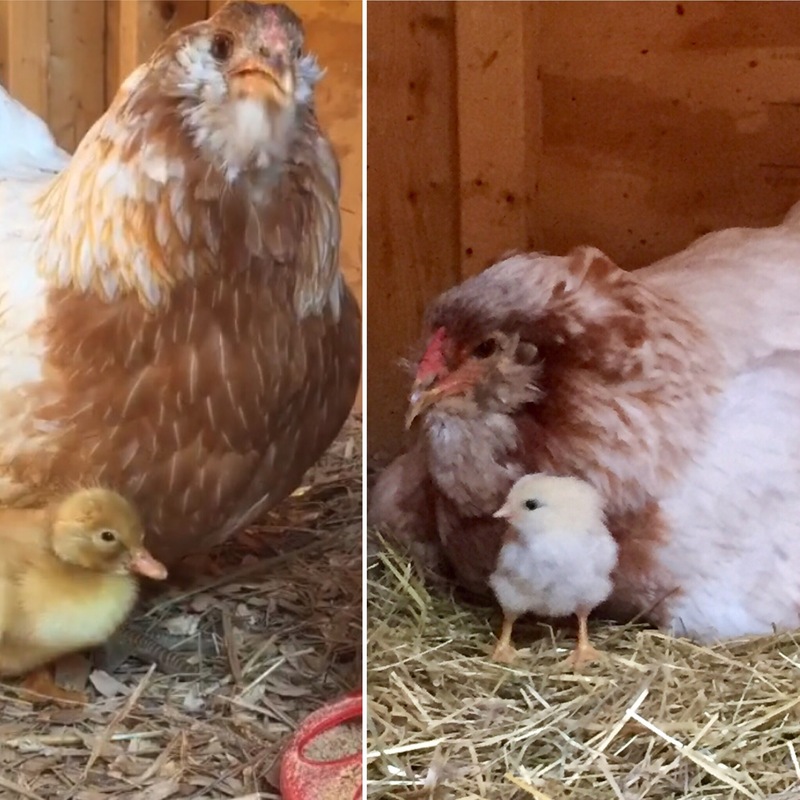 About three weeks later, out popped this one sweet little fluff ball from her nest. It seemed only one of the eggs was viable but mamma and baby were out and about by day’s end. Here she is just two days old. 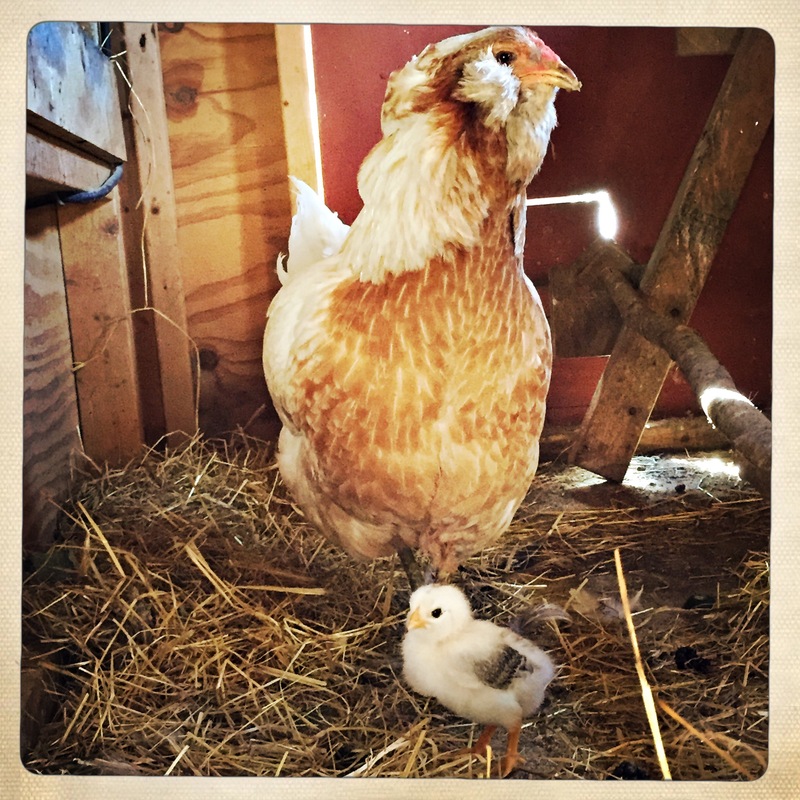 The more I watched her I thought with greater certainty that mamma was in fact the hen who hatched Cupcake last year. Here is a side-by-side. What do you think? 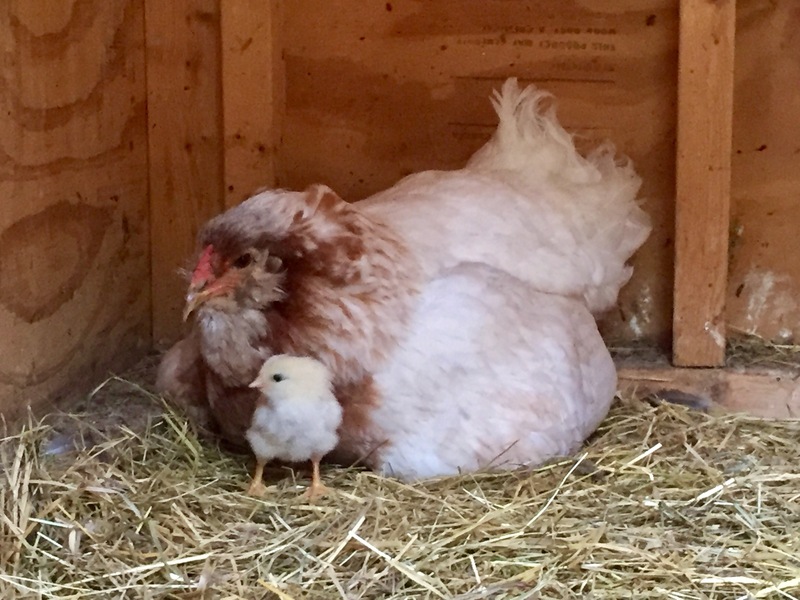 We put mamma and little Sweet Pea in what we refer to as the “baby coop”, our original small coop which we saved and use for isolating birds when we need to. They stayed in there for a week or two to keep baby safe and ensure that she had access to food and water she could reach. One day I gave them some kale and blackberries from the garden. That tiny little bird gobbled down a whole blackberry! Soon mamma was ready to venture out with her baby. Here you can see her teaching Sweet Pea how to scratch and look for food. The pair found a nice place to snuggle together in a duck nest that sits on the floor. Sweet Pea would go in there in the evening and chirp to draw her mom in. She was exhausted by day’s end, after running to keep up with her mamma all day. When mamma arrived, Sweet Pea would nuzzle up against her chest and could barely keep her eyes open. Now this past week, mamma has began to distance herself from little Sweet Pea some. 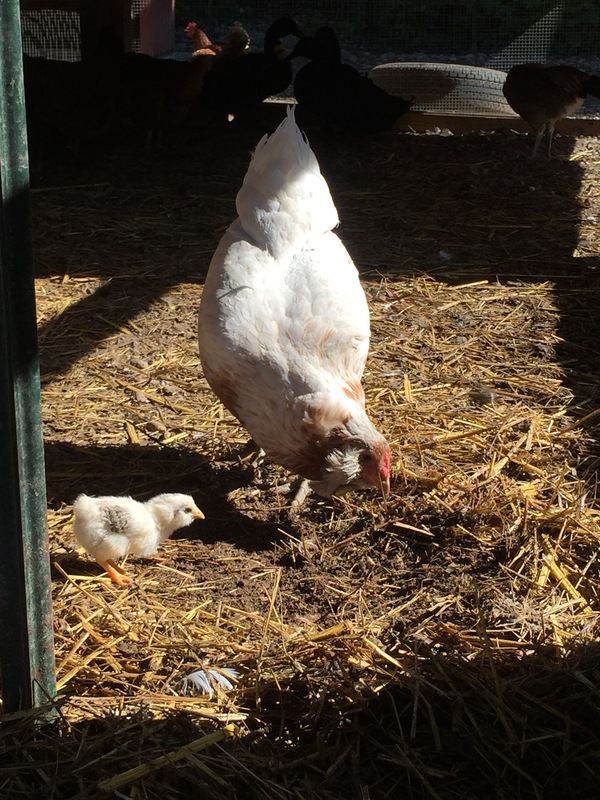 During the day, you can see mamma roaming further away from the coop and baby hanging back inside on her own. At night, I had to go catch mamma and put her down with little Sweet Pea because she was going up into the rafters to sleep leaving her little one chirp chirping alone in the duck nest. 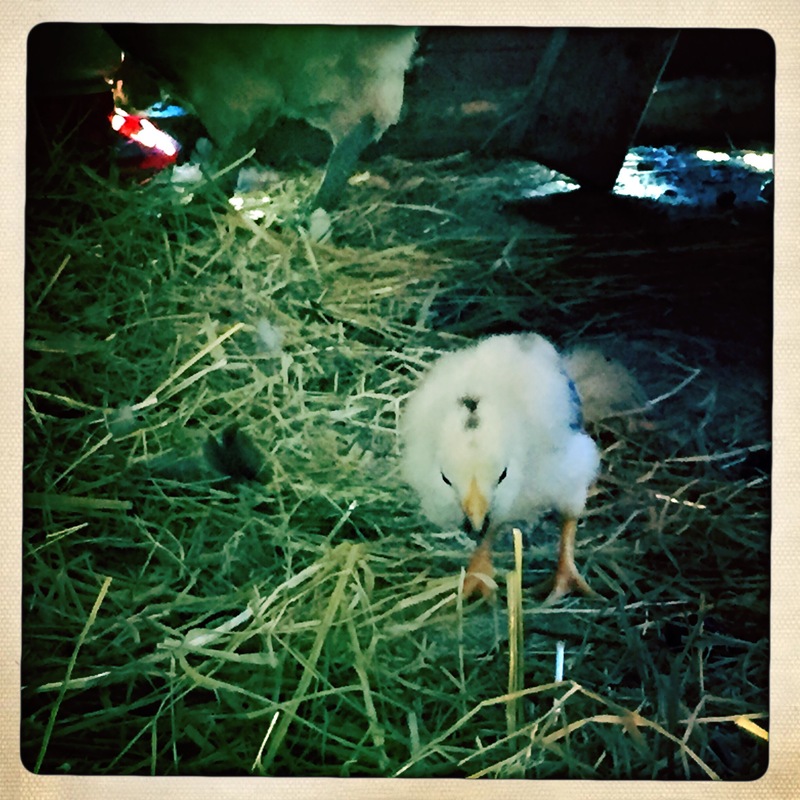 Last night when I went out to check on them baby had gotten herself up onto a roost with the big girls. Though her mamma was in a different coop altogether, she seemed alright so I left them be. I guess eventual separation is a part of raising young but it seems so early! Say a little prayer that our sweet baby will get what she needs from her mamma and grow up strong. She is a tiny gift. That is SO cute!!!! I bet the boys will love this little one. I could never be a farmer! Lol. I’d want to bring them inside and cuddle. Hahaha. Yeah once Oliver picked Sweet Pea up and was carrying her around in the yard. I saw him out the window and yelled frantically for him to put her back with her mamma. When I went out to check if they’d been reunited, mamma was clucking up a storm and had her feathers all puffed out. She did not like having her baby taken away!